In my extensive reading about all things Cruising... 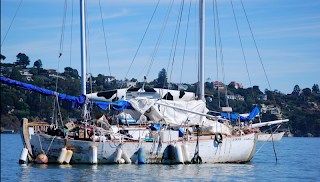 I've found that the term "Liveaboard" may have some negative connotations. I guess this comes from the segment of the liveaboard population that finds the combined cost of buying a near derelict boat and slip rent to be far less than they would spend living on land. Many disregard the rules of society and are blamed with polluting the marinas among other things. There is a fine distinction between being a Liveaboard and being a Cruiser. The obvious would be the fact that the Cruiser actually goes somewhere while the Liveaboard may have a vessel that never leaves the slip and it's possible that some are even incapable of moving due to the deteriorated condition of the vessel. Let me assure you that the time we spend as Liveaboards will be merely a stepping stone to being full time Cruisers... Cruisers-In-Waiting, if you will. The past week aboard Dos Libras with our two cats has been the most recent stone on that path. BYC has a weekend cruise planned for Flato Cut and I wanted to give the felines a chance to adjust to being on the boat before we took off with them on our first on-the-water adventure. During this time, I've had a chance to do some adjusting as well. Our daughter is staying at our townhouse which helps us out. She collects the many deliveries we have coming to the house, she goes through our mail and generally keeps an eye on the place for us. This provides us with a buffer period during which we don't have to get rid of ALL of our worldly possessions... I've made several stops to pick up stuff from the house on my way "home" from work this week. After we do the bottom job early next month we will be truly moving aboard. This week has been an opportunity for me to do some physical as well as mental adjusting, without "ripping the bandaid off". I've been encouraged by how well our kitties have done this week. Jetsam has spent the majority of her time hiding but has gradually begun to spend more and more time out exploring the boat. Jezabelle seemed to remember this place and never skipped a beat. In fact, she seemed to be very glad to be with us, almost needy..., and the first two days here, she followed us everywhere. This lead to a total collapse on the third day that had me a bit worried. But she rallied and seemed to find an even keel (clever use of sailing jargon inserted here) and has seemed very much at home ever since. I know that living aboard while I still work will be nothing like cruising... I've still got to keep a time schedule and I still come home mentally and physically spent every day. Weekends still aren't long enough. The daily routine on the boat is developing into much the same routine as we follow at the townhouse. Bruce still does most of the shopping and even dinner preparation. I go to work while he does boat projects and, if he's lucky...gets in some windsurfing or fishing. We go to bed early and get up early. There are a few differences... one being that the drive is about 30 minutes longer each direction. Luckily for me it is quite beautiful with the view being different every day. Another is that it is easier to relax and enjoy my evenings. Bruce and I talk more and watch far less television. I will have to curb my impulse to have an adult beverage daily however, as it's putting on the lbs rapidly. I need to disassociate being on the boat, with being on holiday... for now. Next week we will play Cruiser. I've got the week off and we plan to do whatever the weather and our inclinations dictate. There will only be a few short weeks left after that, until we truly become Cruisers-In-Waiting.